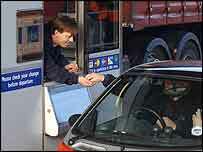 A "new era" in motorway amenities is being promised as the first service station on the M6 Toll road opens. Roadchef, operators of the £15m site at Norton Canes in Staffordshire, claim the facilities will be the best on any motorway in the UK. Motorists will be offered table service in the dining area every evening and complimentary screen washes during quieter times on the petrol forecourt. Roadchef is to bring its other 20 sites in line with the new service station. Other services available on the 68-acre site include state-of-the-art toilet facilities with fragrances being pumped throughout the cubicles, outdoor water features and picnic areas. John Greenwood, chief executive of Roadchef, said: "Historically, the motorway services have suffered from a poor reputation but we are now creating a service that rivals the best that the high street can offer. "At Norton Canes on the M6 Toll road, we confidently believe we have created by far the best motorway services in the UK." The road opened in December last year and operators, Midland Expressway Limited (MEL) claim the toll saves motorists approximately 45 minutes on an average journey time. Tom Fanning, managing director of MEL, said: "The opening of this truly next generation service area is a huge step forward and will, like the M6 Toll road, challenge the view that driving through the West Midlands has to be a stressful experience."